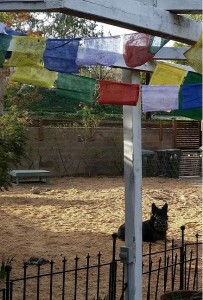 My Bear and I put these prayer flags up the other day. The ratty string you see hanging down on the right forefront of the first photo is the medicine Buddha set he hung up when I first got my diagnosis. Now we’ve put these sets up to celebrate health and generate merit for all those around us who have been struck down with illness (including my dear neighbour who just lost HIS battle with cancer). So for Anna and Irene and Topsy and Sleeps and Bex, Lana and Sarah and everyone else who’s entered our lives and touched us deeply – these flags are our prayers for you. And I just heard that Ruby’s mum Mabel died so she’s added to the prayers as well. And Ruby was too cute with her ball not to include this photo. Namaste – The Spirit within me honours and respects the Spirit within you. What beautiful pictures! 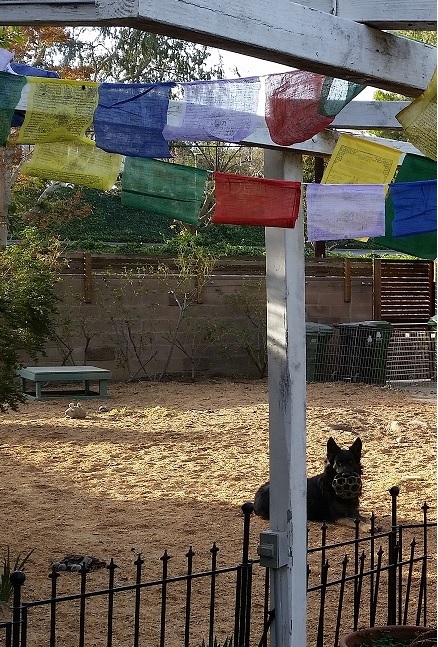 You are always so inspiring yourself Dia, but additionally so with prayer flags. Such sweet sentiments! Thanks Lana! You’re awfully inspiring yourself – and what a lovely sentiment in your comment. They’re lovely! 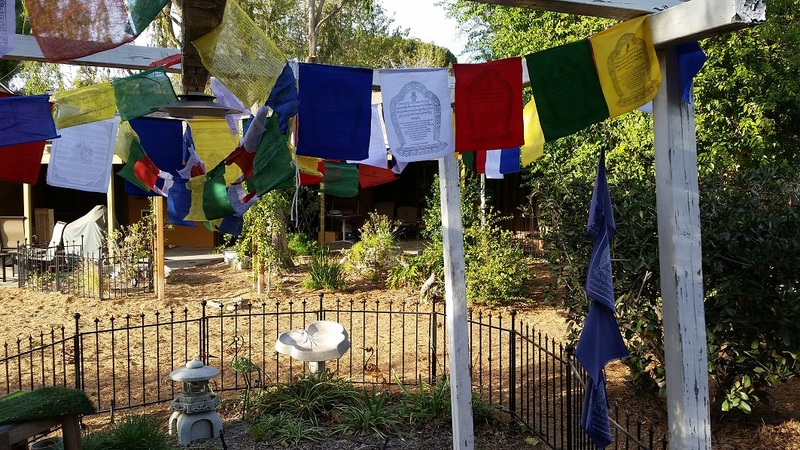 I’ve always had a soft spot in my heart whenever I’ve seen prayer flags. So nice, thank you! 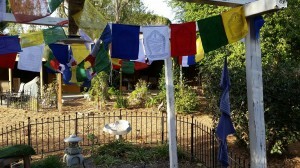 I love looking at your flags, they are full of a beautiful energy. Thanks so much Dia, you are an inspiration. And Ruby does lok very cute. You’re more than welcome TT – hope you feel their energy through the c-c-c-cold up there! Oh, thank you so much. I have them flying off the back patio. I never thought of dedicating their goodness. x0x0x0x Such a kind heart. Smooch! Thank you so much for your kind words. Ruby is AWFULLY cute, and doesn’t really seem to know she’s over two and really should be a serious lady now. Thanks for the smooch! Hope I’ve sparked an idea for you.